Posted October 1, 2002 by niallfarrell in News. Claregalway’s Intermediate footballers are now just “one hour” away from “Senior Football” as they face Clonbur to decide this years Intermediate Championship. It has been a year of “ups and downs” for the team, as they have combined brilliant championship success with in-different league form. In this years championship they have accounted for Clifden, St. Grellan’s and Corofin on their way to the final. Many within the club see this year’s panel as being probably the strongest the Club has ever had. It would be a momentous occasion for the Club to lift the Intermediate Cup as it would be the first time in their 35 year history to do so. The final against Clonbur is provisionally fixed for Sunday 20th October at either Tuam/Pearse Stadium. The Club are asking everyone in the area to get behind the team and to “Deck-out” the locality in “Green and Gold”!! See the Player Profiles further down this page. The accordian and banjo playing give a very professional finish to this CD. Credits to Francis Fahy on the accordian, Celia Redington on the Tenor Banjo and E. Kelly on Lead guitar and Piano. Tommy O’Flaherty is a native of Claregalway and noted for his superb voice. He has held his own one man band in the locality and further afield for many years. I’m certainly not surprised he has produced a CD/tape. His fans will agree “about time”. He has a wealth of material and I feel this CD/tape will be the first of many for Tommy. If this is not in everybody’s Christmas stocking (also a great gift to send abroad) I will be more than surprised. I’m already looking forward to his next release. REFLEXOLOGY – Reflexology is preventive health care. Preventive health care is becoming more important as we realise the health threatening dangers of our environment such as stress, fatigue, chemical additives in food, polluted water supplied, radioactivity to name only a few. The added strain on everyone’s immune system today should warn us to find time to unwind. Reflexology seems to help the immune system. Acne is usually made up of a mixture of different types of spot, often against a rather greasy background skin. There are inflamed spots, some of which turn into yellow heads containing pus; blackheads or comedones; deep and tender lumps are known as nodules or cysts; finally scars which may occur in severe cases. All of these blemishes are based on hair follicles. Acne usually starts in puberty. The causes of acne center around the sebaceous (grease) glands. These are most numerous on the face. They produce a greasy fluid called sebum, and in adolescence enlarge and produce more sebum in response to rising hormone levels. Testosterone is the important hormone controlling these glands and the increased levels of sebum produced can lead to blockage of the pores. This in turn holds sebum back and this can lead to blackheads and can give an excellent growth medium for certain bacteria. Increased numbers of bacteria can cause skin irritation and inflammation, cysts may form and cause scarring. Spots should not be squeezed or picked as further inflammation and scarring may result. Greasy or oily cosmetics should also be avoided. Medical treatment while sometimes working quickly in mild acne can often take a long time to work in severe cases. Antiseptics are a popular first line treatment, e.g. benzyl peroxide acts by reducing bacteria, sebum excretion and helps to loosen blackheads. Vitamin A type creams such as Isotrexin (prescription only) can also reduce both sebum production and blackheads. Sunlight can improve the skin of most acne sufferers. Antibiotics both topical and oral are also often prescribed. Hormone therapy and Roaccutane are treatments also considered by doctors. Unfortunately there are still a few who have severe acne, which does not respond to therapy, but on the whole there is now an excellent and ever improving range of medications to cope with the battle to keep acne under control. John Duffy MPSI Claregalway Pharmacy. Tel. 799754. Open 9 AM to 8 PM Monday to Friday and 9 AM to 6.30 PM on Saturday. Weather, the most topical of all Irish conversations and what dictates how successful our year in the garden is going to be! Have you ever noticed how weather dictates our moods, on a bright sunny day, you can expect to see cheery smiles, whilst on those dark, dark gloomy days, people are in less buoyant mood, “more frowns than smiles”! So it was this summer, a 50% increase in rainfall and less sunshine, so less time spent in the garden and plants, particularly bedding plants, not doing at all well. Those dependent on weather, I.e. the farmers, landscapers, growers all suffered and in the long run so too does our economy as there is less money in circulation. But then a ray of sunshine in the month of September. What a marvellous spell of weather and all the jobs in the garden made easier by this sunny spell. People seeding lawns, planting, spraying, harvesting, pruning etc, all completed. So to this month and the tasks to be completed, a month when we start getting frosts and the days begin to shorten. With this comes the end of the growing season with plants going into dormancy. It is usually a good time to plant new material or for moving existing plants. Lawn mowing can continue at least until the end of the month or until the ground becomes too soft to support the mower without doing damage. The lawns at this time of year may need a little bit of intensive care, so apply an autumn lawn feed to see it through the winter. The season is coming to an end in the vegetable garden. Many crops should be removed, otherwise they provide a ‘green bridge’ for diseases and pests through the winter. Good hygiene involves composting all old crops and digging the soil as soon as possible. If some bulky organic manure is dug in at this stage, it will keep the soil open during the winter while it rots down. Spring cabbage can be planted now. Root crops such as carrots and swedes can be lifted and stored. Parsnips are best left in the ground. Maincrop onions are starting to turn yellow at the tips and should be lifted now. Insert a digging fork under the bulb and lift them slightly to loosen the roots without breaking them. This will hasten ripening, but don’t bend the tops over as this only invites disease. Spring bulbs herald the coming of spring and never cease to amaze me, as you plant them, forget about them and hey presto a lovely surprise in Spring! Bulbs are cheap, come when you least expect them, return every year and multiply in numbers. Plant them now and don’t forget it is too late to be looking for them when they are in full bloom next spring. Crocuses are very popular for low planting in single colours or mixed bunches, in the sun, covered with about 2 inches of soil. Snowdrops need no introduction, but plant them in a rich free draining soil. Daffodils are everyones favourites – for very windy locations or tubs at this time of year, ‘Tete a Tete’ is a great variety. Tulips are best left for planting until last to help prevent slug damage. There are the usual old tall varieties and now lots of dwart varieties for pots. Hyacinths come in two forms, one for planting out into the garden and one especially prepared for flowering indoors for Christmas, both having fantastic scent. Hyacinths for Christmas can be planted early ; singly or in a group of the same colour. Place them in a dark, cool place in moist garden compost and the buds will begin to appear after a couple of weeks. Bring them into the light to green them up and enjoy them after that! Planting depths for bulbs is roughly three times its own depth, down in the soil and place at least 4-6 inches apart as they do multiply quite rapidly. Any bedding plants that get frosted, should be removed. Some of the half hardy annuals can be saved for next year. Don’t leave it too late after the plants have been hit by frost. Busy Lizzies, pelargoniums, fuschias, geraniums and osteospernums are all worth saving. Cut the tops back by half, pot them up, remove all old leaves and flowers and leave them in a cold frost free place, otherwise you can bring them into a heated greenhouse or a warm well lit room where they will carry on flowering. Seeds can also be collected off plants at this time of year. Look for brown seed pods, if wet let them dry out on newspaper. Break open the pods and shake out the seeds. Avoid mixing chaff and seeds. Place in a paper bag or tin foil and label clearly for sowing next Spring. What colour can I put in my pots now that the summer bedding is finished? The first answer to this is that the same range of colour is not available in winter as in summer. So do less pots and boxes. Concentrate on areas near front doors, entrances, kitchen windows, etc. – where they will be seen best. Winter pansies, winter violas, spring bulbs, wallflowers, chrysanthemums, polyanthus, winter heathers, skimmia rubella (large red flowers), gaultherra procumbens ( red berries), variegated ivies all offer winter colour. The sooner these are planted the better established they are for winter. Fruit trees can be harvested now. This has been a bad year for all fruit trees. How can I keep the fruit? Well, use trays with open layers and stack them in that or roll up undamaged fruit in a roll of newspaper and keep in a dark place. Another way is to put apples in a plastic bag and close the top. This builds up the carbon dioxide in the bag. Put two pinpricks in the bag to prevent excess carbon dioxide (carbon dioxide is used in cold rooms/stores). Store the fruit in a cool place and the fruit should last. Apples are the best keepers. Finally FEED ALL fruit trees now with sulphate of potash! One fistful around the base of each tree. Like everybody else in this world, my day and week revolves around the clock, rushing around oblivious to everything else. This morning before I sat down to write this article, my son on the way to school opened up my eyes, talking about Autumn colour and pointing these things out to me. I was going to write about the kaleidoscope of colours we get in Autumn from different foliage and that would be it in the written word. I wouldn’t have slowed down to take time to look at them and marvel how great it is. So this month slow down, take time out and look at the autumn foliage colours all around you. The most popular climbing wall plant at this time of year is the ‘Virginia Creeper’,” Parthenocissus Veitchi” , a blaze of autumnal colour or its counterpart, the ornamental vine, “Vitis Coignetiae”. Two popular shrubs with nice autumn colour are “Rhus Sumach” (Stags Horn) and “Cornus Midwinter Fire”, a deciduous shrub with golden stems in the winter after it has lost its autumnal foliage. A plant that can be planted in the garden but can be seen grown in the wild, in the hazel woods all around these parts, is “Euonymous Europaeus”. The common spindle as it is known, it has attractive lobed fruits that split open to reveal their orange seeds. P.S. Best wishes to the Claregalway Football panel and management in the upcoming Intermediate football final. 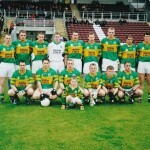 This team are worth supporting and could be a Senior Football Team in 2003. Good luck lads from all at Glynn’s! Best wishes to Brian Place (our crossword expert) who is taking early retirement after 30 years in GMIT, where he spent many years as Head of Science. Their loss is our gain as we hope Brian will become more involved in Nuacht Chláir!! Wedding congratulations to Stephaine Murphy, Creboy, who wed Jason Penn, Austraila on the 27th September. Congratulations to Lisa McKenna, Cregboy, who became engaged to Justin Frost, Australia on Friday the 13th Sept. Lucky date for both of you! Speedy recovery to Annette of Hughes. You are really missed at front counter. Congratulations to Enda O’Connell, Gortacleva, who celebrated his 21st birthday recently. Happy birthday wishes to Matthew Moran, Gortatcleva on the 29th September. Happy birthday wishes to Brian O’Donnell (employee of Bosco McDermott) who was 20 on the 2nd October. Good luck Brian in your Horticultural Course in Termonfeckin. Birthday wishes to Aisling Duggan, Montiagh who will be 1 year old on the 18th October. Congrats to Averyl Farrell, Cregboy on passing her driving test. There’ll be no stopping her now!! The day I started school, not five years old yet. Into my class I go, I try to hide. “We’ll send your parents home for a while”. My first day at school wasn’t so bad after all. Very talented goalkeeper who has deputised with authority since Brian Donoghue’s injury. Has conceded only 1 goal in 4 championship games. Has promised “free Bar” in Spanish Arch should team be successful. Sound Barry! No nonsense corner back who has had his fair share of injury problems this season. Time-keeping for early morning training sessions has been exemplary …not!! (“the alarm didn’t go off Roddy”). The ‘Manager’s brother-in-law, has been a tower of strength at corner back. Takes no prisoners and when Padraic puts in the shoulder few forwards know what hit them! Captain of the team who is truly back to his best. Leads by example. Tight marker on and off the field. Says he’ll get all the panel into ‘Central Park’. Knows “bouncers”. Sure, they’ve thrown him out often enough! Very experienced corner back – can always be depended on to give his best. Tight marking one of his main attributes and likes collecting bits of opponents shorts and jerseys!!! Another one of the ‘auld lads’ who is still able to show the ‘young fellas’ a thing or two in training. Another brother of the manager. A veteran of the ’94 team, Noel still feels he can sort a few corner forwards out! Also supports the ‘pool’. Tommy has had a great season at left half back. A player in the “Declan Meehan” mode, he defends “tigerishly” yet can storm up-field with a trademark solo run and point! Does not like early morning training sessions. Says he is more of a “late night man”! Affectionately known as the “Grunt”. This tough youthful defender is another future star for Claregalway. Got his first full cap against Corofin and came through with flying colours. Another natural footballer with an abundance of skill. A very versatile performer, but most effective at wing back. Gave a man of the match performance marking Derek Savage earlier in the year. 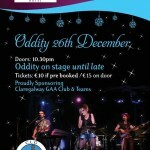 Also stars for ‘Claregalway Celtic’. Yet another promising wing back. Very committed trainer with a Roy Keane type engine. Spies on the drinking habits of the players in the Summerfield Bar. Reports back to the gaffer!! Brother of the “Gaffer”. Outstanding centre-back. Gave man of the match performance in semi-final. Models himself on Kieran McGreaney even beginning to talk with an Armagh accent! Resident C.P. goer, needs to work on his chat up lines.! This much travelled journeyman talks a great game. Likes sunbathing around Salthill. Favourite film “Serendepity”. Not the same since “Dub” left. Would love an Intermediate winners medal, would love any medal in fact!! Mr. Versatile, can play anywhere from corner-back to wing forward. Stays running all day even though it is as the one pace. Still hopeful of a career in “Hollywood” – a great thesbian. Another future Claregalway star. Attack minded – wing back. Non drinker, non smoker, non student. One of the so called young lads. ‘Franny’. Brings a wealth of experience to the Claregalway half back line. Great natural balance and agility on and off the field, ask Olivia! Enjoys going forward and post-match pint! Member of Galway Minor Team which won this years Connacht Championship. A definite star of the future. This 6’6’ midfield giant has been a ‘collosus’ this year and Kevin Walsh can retire peacefully knowing Barry’s around!! A very reliable midfielder who has been a consistent performer all year. Has taught ‘young’ Barry a trick or two about midfield play. Has attended 135 training sessions since February – this man loves training! Has 10 full International Caps for Inishbofin. Probably one of the fittest members of the panel. Best position midfield/half forward. Enjoys a quiet pint in Sally Longs with the rest of the Hell’s Angels!! Hurled with ‘Cashel’ for a ‘short’ while this year. Paul is no doubt the ‘longest serving member’ of the panel. Now in his 17th season playing for Claregalway at this level he brings a wealth of experience to the team, will consider “retirement” only if ‘Senior Status’ is achieved! Richard Donovan Lydican Wood Company Rep.
Another ‘elder’ member of the squad – Richard has played in every position for Claregalway and is now settling down as a “full forward”. He, along with Paul and Noel are the only survivors of the 1994 winning team. Likes dancing shirtless after games!! Mick Derrig River Oaks Company Rep. This powerfully built Mayo man has been a welcome addition to the panel this year. Versatile player, at home at full-back or midfield. His son Sean, has been voted “water-boy” of the year and has attended more training sessions than some of the players!! Declan O’Brien Carnmore Cross Company Rep.
An inspirational figure on and off the field. Declan leads the attack from centre forward and his ‘subtle touch’ coupled with his physical presence are the driving force of the ‘forward division’. Will treat everyone to ¼ pounder and chips if we win final!! Well what can be said about this man? In ‘full flight’ Anthony is a truly wonderful footballer – can kick scores comfortably off either foot. A quiet man off the field. Has been known to let it all hang out every now and again!! Enda has been our most profilic scorer in this years championship. Got the all important penalty in the semi-final. Forgiven for missing one in first half: Can play a bit of soccer too! Exceptionally talented forward who kicks trademark long range points. Known as ‘shooter’ for his talents on and off the pitch. Loves training even more than Brian Day!! Very lively corner forward who has endless stamina. Has been known to score the odd crackin’ goal (in training!). Nickname “Minime”, “Pat eat all the pies”! Ex-trainer of the Intermediates but he assures us he will be back! “The flying Accountant”. Adrian has been “on fire” in recent months and has made the number 10 jerey all his own. “Brolly” as he is effectionately known by the squad has one of the sweetest half boots around. Known for his “booming” long range efforts. Has lot 6 balls during training – all gone over the ditch at the “Lakeview end”. Hmmmm? One of the most talented members of the panel. Martin’s year has also been plagued by injury. With ‘Red’ Kelly around, Claregalway’s future is very bright. The man from ‘the Kingdom’. Idolises Pat Spillane! The ‘roving full forward’. Promised to ‘kit out’ the panel in ‘Armani’ suits for the final. Said he knew a guy who did good deals. We’re still waiting to be measured up Ger! A ‘Wonderful Striker’ of the ball. Kevin is another man who is back to his best. Did however recently miss a 14 yard free in front of the posts! We won’t forget that one Kev! Known as ‘veg’ to his pals, Conor has just headed off to the join the army. Great timing Conor! Another future star for the club. We hope he learns to ‘shoot’ straight with army! Yet another of our young stars who has had his fair share of injuries this year. Tough, uncompromising defender. Gary spent the summer ‘having a life’ ‘Stateside’. Very pacey forward who claims he can run and drink faster than any other player! Monaghan & Sons Ltd., Tuam Road, Galway. for their very generous sponsorship this season. EVERY year people wonder how they do it, but once again Compantas Lir the Claregalway/Carnmore drama group have come up with another brilliant evening of entertainment for their annual supper theatre programme which runs on Wednesday October 16th, Thursday October 17th and Friday October 18th at the Carnmore Community centre. For three nights, they will stage two hilarious plays with casts and crews all from the area, as well as serving a meal with wine and tea/coffee in the interval on all nights. The annual supper theatre is the main fundraiser for the drama group who will be heading on the All Ireland drama circuit again in the Spring, and the high standard that has seen them rated in the top four in the country for the past few years will be reproduced for this special once off three-night run in the heart of their community. The two plays this year are the riotous Halloween produced by Philip Cribbin and starring John Mannion, Padraic O’Connell, Mary McCarthy, Vincent Moran, Bernadette Prendergast, Niamh Kavanagh, Ursula Cribbin, and Paddy Greaney. The play by James Scotland is a Decameronian comedy set in a monastery and follows the tales of some experimental monks who unwittingly conjure up some mythological beauties with hilarious consequences. The other play is Chekhov’s The Bear, directed by Kevin Duffy and starring Malachy Noone, Patsy Cahalan and Sinead Greally making her debut with the group. The plays start at 8.30 each night and there will be spot prizes on offer each evening. Tickets at 11.50 euro each are marvellous value as that includes the two plays, a meal, tea/coffee and wine each night and attempts by other groups throughout the country to provide an evening of such value and standard have been unsuccessful. However, the tickets are limited and are flying out the door so if you want to avail of this marvellous offer, then contact Seamus McNulty at (091)798862 immediately. Please specify which night you want to attend,Wednesday, Thursday or Friday. As part of their ongoing development programme, Compantas Lir will be staging intensive training workshops for its members at the end of November, featuring tutorials and lectures from some of the top drama practitioners in the country, as the group goes from strength to strength. Rehearsals for this year’s three act play for the All-Ireland circuit are set to start in December, with a three night run scheduled for the Town Hall Theatre in April and in Claregalway during the drama festival. Further details of that production will be unveiled next month. From 9.10 a.m to 9.30 a.m.
Everyone else’s children are the least of their worry. No child can walk a few yards anymore. They have to be left outside the school door. It’s our last chance each morning to have a nice talk. The season is now fully under way, and the hall is almost completely booked. Activities taking place include badminton, basketball, karate, indoor soccer, indoor hurling and the meeting room upstairs is available for meetings. The committee are still awaiting word on whether they will receive funding towards the planned refurbishments, and hope to hear before long. The fundraising calendar is currently with the publisher, and will be available from the end of the month. All proceeds will go towards the upkeep of the Centre. Thanks to the many local businesses who have again given sponsorship. The calendar will be available from any member of the committee, and it is also hoped to have it on sale locally, as last year. Further details later. The Annual Craft Fair has been set for Sunday 1st December. The committee are hoping to build on the success of the last two years. There will also be a cake sale and raffle on the day, as well as several events for children. More details to follow in the next issue of Nuacht Chláir. Committee: Carol Steven (Chairperson) – 798660, Siobhán Lynskey (Secretary) – 798201, Tony Clarke (Vice-Chairperson) – 798942, Helen O’Connell (Treasurer), Mary Forde, Maura Harte, Gerry Mooney, Ger Brett, Paddy Barry, Patricia Carton, Ann King, Gabriel Kearney. A.G.M. 6TH NOVEMBER IN PARISH CHURCH MEETING ROOM AT 8 P.M SHARP. Provision of 30+ bilingual townland names in Claregalway and surrounding areas. Restoration of 3 pumps in Claregalway, Montiagh and Cloon. Provision of bottle and clothes banks in Dunleavey’s car park. Implementation of FAS scheme in November 1996. Erection of Famine Stone and landscaping area adjacent to Claregalway National School. Planting of trees on main road. Initiated the establishment of the Náionra (Irish playschool) in Claregalway, adjacent to the Leisure Centre. Initiated negotiations for the provision of tarmacadan at the Leisure Centre. Erection of 3 “Welcome to Claregalway” signs on approach roads to Claregalway. The biggest achievement the Group completed was the restoration of the 9 Arches Bridge in Claregalway. This was done in conjuction with Galway County Council and the local FAS scheme. The addition of lights under the bridge has enhanced the bridge further. The above projects were taken on by a voluntary body of concerned people living in Claregalway and it just goes to show what can be done. With all our newcomers to the area, more projects can be undertaken. We have a beautiful Abbey surrounded by the River Clare. We could have river walks along the river banks and a park/tourist office? just one of many many ideas. For those of you who would like to become involved and make Claregalway a better place to live in, come along to the AGM on Wednesday, the 6th November in the Parish Church Meeting Room at 8 p.m. sharp. Please come along! As stated before, YOUTH is not defined by age but by state of mind – so everyone is welcome! A lot of effort is put into Youth Choir but the emphasis is on fun. We also strive to learn an appreciation of music and song, together with their enhancement of the Mass. Our highlight of the past year was the Concert in Church on Sunday 9th June last. It was a very enjoyable concert and the children were simply wonderful. Lots of singing, music and a little dance and mime were the order of the day and we were honoured to be joined by Jimmy Norman of Galway Bay FM and Frank McCaffley, vocalist and musician, who travelled all the way from Westport! A total of 645 Euro was donated at the concert and this money has been given to St. Bernadette’s Children’s Ward in UCHG. Finally, many thanks for all your good wishes following my recent “tumble”. My broken ankle is healing well, thank God, and thanks to the wonderful support of friends and neighbours. 1 have been thoroughly spoiled and will have great difficulty returning to my normal routine. Thanks, particularly, to my family Mike, Pat and Emily – they will be glad to see the end of these crutches! Carnmore had an excellent run out in the Castlegar U10 tournament. Clarinbridge defeated the Carnmore in the semi-final and went on to play Turloughmore in the final. The youngsters gave a good display throughout the tournament and were well prepared and coached by Sean Grealish and John Keane. The panel are awarded medals for their position in the Tournament. Carnmore put up an excellent display in the U12 County Final played at Athenry at the beginning of August. In a game that was closer than the scoreline suggests, St. Thomas’s were just physically too strong for a very skilful young Carnmore side. Carnmore started very well with an early goal but St. Thomas’s took over during the latter stages of the first half and went in at half time with a lead scoring a goal just before the break. Carnmore fought back after the break scoring a second goal but St. Thomas’s immediately hit back with a goal of their own. From there St. Thomas’s finished the stronger side and winners. A very special thanks to Paul Kilgannon who put in special effort with the team all year, to all the mentors, John Carr, John Fox, Gerry Fox and Andrew Talbot and to the team “doc” Joe Hennessy. The committee would like to thank the sponsors of the team. Congratulations to Barry Hanley and Kieran Murray who were chosen to represent Galway at U16 and Aidan Nally who was chosen at U14. The Annual Juvenile Fundraising Dance will take place in Grealish’s on the 26th of October. Music is by Babylon and tickets are €2.50 each. Your support is appreciated for this event. The presentation of all Juvenile medals will take place at the Carnmore Center on Friday the 8th of November. Notice will be given to the teams closer to the event. Indoor hurling will resume for the Winter on Wednesday the 13th of November at the Carnmore Center.